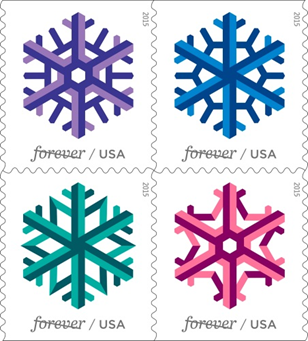 NEW YORK — Post Offices across America are experiencing a blizzard of new Forever stamps today with the introduction of the Geometric Snowflakes Forever stamps. Available in booklets of 20, the stamps can be purchased on usps.com at this link, at eBay at thislink, by calling 1–800–STAMP 24 (1-800-782-6724) and at Post Offices nationwide. The law of physics makes each snowflake unique and each of the four stamps depicts a different snowflake. When it snows, millions of ice crystals form unique patterns that are as stunning in their complexity as they are fleeting. Stamp designers were inspired by the different shapes. Each snowflake is drawn in one of four colors: purple, pink, green or blue. Applying light and dark shades of color enhanced the intricate geometry of each flake and added a feeling of playfulness to the stamp art. Forever stamps are always be equal to the current First-Class Mail one-ounce price. The stamps were designed by Antonio Alcalá and Leslie Badani of Alexandria, VA.
After applying the first-day-of-issue postmark, the Postal Service will return the envelopes through the mail. There is no charge for the postmark up to a quantity of 50. There is a 5-cent charge for each additional postmark over 50. All orders must be postmarked by Dec. 22, 2015. 680408, Press Sheet without Die-cut, $58.80. 680410, Keepsake (set of 4), $16.95. 680416, First-Day Cover (set of 4), $3.72. 680421, Digital Color Postmark (set of 4), $6.56. 680430, Ceremony Program (random), $6.95. 680431, Stamp Deck Card, $0.95.